Spring flowers are in full bloom and EASTER is here once again. The bright green grass in yards looks like putting greens strewn about the neighborhood. The roaring of lawnmowers and the smell of fresh-cut grass fill the air. Looking out over our freshly cut yard yesterday, I couldn’t help but think about all the Easter egg hunts happening this weekend. The bright-colored eggs hidden among the blades of grass and the joyous shouts of the lucky finders. For me. as a child, Easter egg hunts were a major event thanks to my Uncle Ted, the master planner of the hunts. Our Easter egg hunts took place over three connected yards. It wasn’t your average Easter egg hunt, it was an epic adventure. Every year uncle Ted drew a very detailed map of the layout of the three yards. Every tree, bush, fence, nook and cranny of the yards were all on the map. The map was for his eyes only, for the map was the treasure map of all the hidden jewels. The jewels were brightly colored construction paper Easter egg cutouts with a number written on one side, a secret code. The other treasures to be found were in the clover patches. The clover patches that my brother and all our cousins sprinted eagerly to first held the big treasures- plastic Easter eggs filled with shiny silver dimes. For one truly lucky finder, there was the golden egg. The golden egg held the biggest treasure-a whole dollar! Once the clover patches were picked clean, we all began our own treasure hunts. Each of us seemed to have a favorite place to check first. I don’t remember how much time we had to hunt for treasures, but it never seemed long enough. Once time was called we got to turn in our paper eggs for delicious Easter candy. The numbering changed each year, so you never really knew what treasures you had in your basket until the turn-in table. My mom was always happy when she saw I had Heavenly Hash eggs. Uncle Ted would then check off the corresponding numbers to his treasure map to make sure all the eggs were found. They never were. To the delightment of all us children, back out we would go. This time, however, Uncle Ted would gently “guide” us to the general area or bush of the missing eggs. Sometimes we could find them, sometimes we could not, and sometimes not until next year. Yep, each year there was always a faded egg found and turned in with a duplicate number the next year. It may have been outdated, but always still counted. After the hunt came lunch and games of Bingo. As I was telling story after story of Easter egg hunt adventures to hubby yesterday, I decided to honor Uncle Ted for all his love, work, and dedication that made such fond memories for my brother and me and all our cousins. I would honor him by creating a dessert that held so many memories of my childhood Easters-the big hunt. Jello was always on the Easter dessert table and Uncle Ted loved jelly beans. 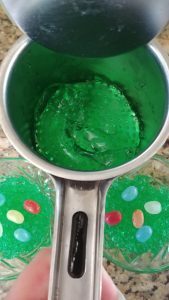 This recipe is as easy as making Jello, just with a slightly different water combination and a secret weapon -a potato ricer. Yes, for fun, I do like to “hide” some of the jelly beans among the “grass”. In a 8x8 casserole dish, add Jello. Stir in boiling water. Continue to stir until all Jello is melted. Using a large mixing spoon, spoon Jello one spoon at a time into a potato ricer. Rice Jello straight into ramekins or dessert bowls. Continue until all the Jello has been used. 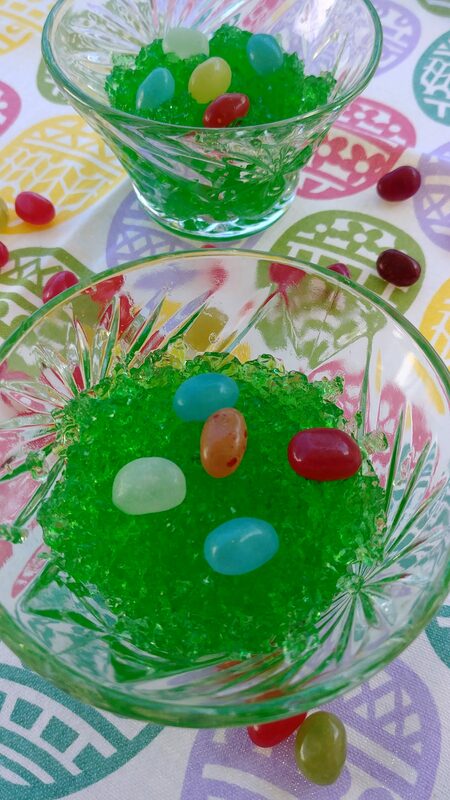 Garnish with jelly beans on top and/or tucked under the "grass"
Put Your TO COOK IS TO CREATE Thinking Cap On: Think about all the different colors of “grass” you can make using different flavors of Jello. What other “treasures” could hide among the grass? Blueberries? Chocolate chips? Mini colored marshmallows? Think about using this “grass” as a bed for the famous Jello eggs. Want to dress the dessert up even more? Place a Peep among the “grass” surrounded by jelly beans or use as edible grass garnish for a cupcake. Think about how your kids or grandkids enjoy their Jello and have a little fun. FOOD FUN: This was definitely fun for me. Funny how such a simple thing like looking out over fresh cut grass could bring about such wonderful memories and a new tasty Easter treat. What food dishes could you create to recreate childhood memories? Such precious childhood memories! Uncle Ted lived for Easter and THE HUNT! 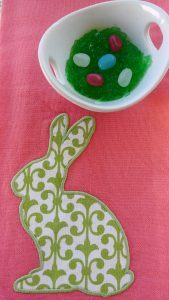 I am sure that he would truly enjoy your Edible Emerald Easter Grass…what a fun idea. I too remember you and your brother running around hunting the treasures…everyone always found ample eggs to fill their baskets. It was a glorious day of love and family. It added an end to a perfect Easter…more blessings than we could imagine.